The morning of Wednesday 27 April was cool and cloudy but that didn’t dampen the enthusiasm of the ten teams that headed out from the BiblioWorks office to take up their positions at bus stops around Sucre. Each team jumped aboard a bus, showed the driver the permission slip from their union (and gave him a book), one volunteer taped up a Reading Festival while the other spoke as quickly as possible about BiblioWorks, the Reading Festival and the importance of reading. Passengers were then quizzed on these topics and those who could answer correctly were presented with a book! With a round of “muchas gracias” and “we hope to see you at the Reading Festival”, the team disembarked and boarded another bus to repeat the process. Each team boarded at least 10 buses with most making it onto closer to 15. Early on Saturday 30 April, staff, interns and volunteers met at the BiblioWorks office to load tables, chairs, food, prizes and more onto the hired buses to take it to the Casa Municipal de la Cultura to get ready for “La 5ta versión de la Feria de la Lectura”. By 8:30 am, we had unloaded the buses and as we set up the first one left to collect students and teachers from a school on the outskirts of Sucre. 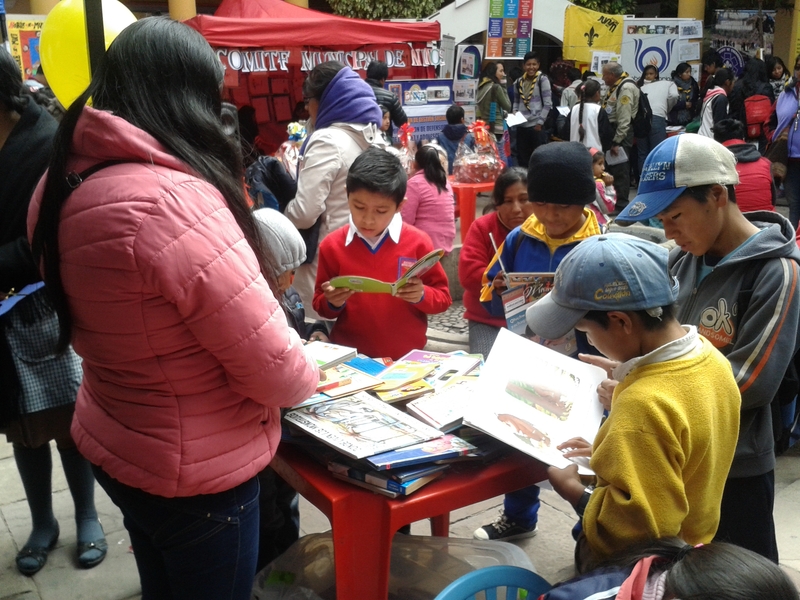 Seventeen different organizations set up stands with a wide-variety of hands on activities designed to promote reading. Staff and students from 30 different schools attended throughout the day; of these 10 of the schools were served by the BiblioBuses. There were also many families that attended and many people were attracted by the festivities as they were walking by and came in to see what was going on. Throughout the day, more than a 1000 people took part. Everyone who visited the festival was presented with gifts as they departed. The six best stands also each received a gift basket. The baskets and the gifts were all donated by local businesses and organizations. After the baskets were awarded to the exhibitors, things began to wind down and once the last groups of school children had been delivered back to their communities, we loaded up the buses once again and returned to the BiblioWorks office. The day was a wonderful culmination of time and hard work by all involved and everyone was very pleased with the results. 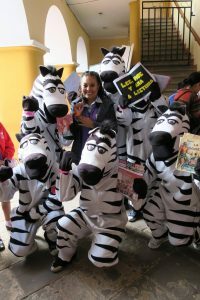 *The zebras, affectionately known as “cebritas” (little zebras), work as crossing guards here in Sucre and are loved by children and adults alike.